Ectopic pregnancy can be a terrifying experience. 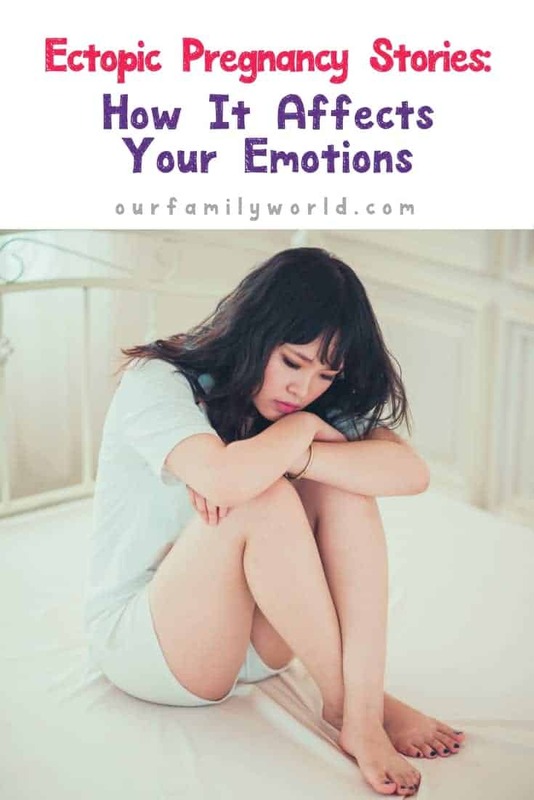 Between the physical and emotional pain, the procedures to fix it and the worrying about whether it will cause future infertility, it can really put you through the wringer. We’ve talked about ectopic pregnancy signs, symptoms and treatment options before, but never really delved into the emotional turmoil that this type of pregnancy can cause. Now, we are sharing personal stories to discuss the different emotions women go through after an ectopic pregnancy. In some cases, an ectopic pregnancy can be as emotionally painful as a miscarriage, as Olfa shares in her story. My children are 6 years apart in age and I am often asked why. Sometimes I do not bother to answer. Sometimes I reply bluntly: I had an ectopic pregnancy! Usually people stop there and I don’t want to share more: Because even if its been over 7 years, the hurt of losing a baby remains there: the baby would have had 8 years now! How did I discover I had an ectopic pregnancy? I was 8 weeks pregnant and at work when I noticed some bleeding! I did not pay much attention to it but unfortunately the following morning it continued and I had cramps! I called the doctor and he recommended some rest. Throughout the day it continued and the pain became more and more intense! I went to the ob/gyn who took an ultrasound and announced: madam, we don’t hear the heartbeat of the baby. Imagine my shock! My husband was with me and I almost fainted when he said it. I wanted to tell him: please listen again! Are you sure, is your equipment defective? You know: you don’t want to believe bad news! But it was not! He had to inject a medicine “similar to the one we use to cure cancer patients,” he said! Really, adding to the shock that I lost the baby he announced that terrible news! He said it was better than surgery. So he did that and of course he had to remove the baby! The worst experience ever! The nurse and the doctor were chatting while I was experiencing such a trauma! Anyways, I woke up in the morning pregnant and I was not in the afternoon! I came back home (with the support of my husband) tired and depressed! It took me three months to recover physically from that. I don’t know if it was the medicine or the emotion but it was a tough time! I got back to work after 3 weeks! While some people think it is crazy, it was a way for me forget! Nine months later, I was pregnant with my daughter! While I never personally experienced an ectopic pregnancy, my grandmother nearly died from one. It was the early 1950s, when medicine wasn’t quite as modern as it is now. She already had one child, my aunt Terry. I don’t even think she knew she was pregnant with her second child. The didn’t exactly have the best pregnancy tests back then. One day, she started experiencing intense pain in her abdomen. It spread up to her shoulder area, as is common in ectopic pregnancy. My gran was a tough woman. She worked as an EMT and was always on the go, so she pretty much just tried to deal with the pain. Days passed and the pain became excruciating to the point where my grandmother was ready to pass out. She finally decided it was time to go to the doctor. They rushed her into surgery. Her tube was on the verge on bursting! The doctor told her if she had waited any longer, she would have been dead! He had to remove the entire fallopian tube. He told her that she would probably not have any more children. Obviously, she did, since I’m here today to write about it and I wouldn’t if she didn’t have my mom. In fact, she had four more children after that experience. Going through something as traumatic as an ectopic pregnancy can make you feel alone. Knowing that others out there have been through the same thing can often help. Take a look at a few stories from others that may help get you through a rough patch. The Ectopic Pregnancy Foundation shares a powerful and heart-wrenching story about coping with ectopic pregnancy after trying to get pregnant for many years. It took me six years to get pregnant with my son. I would have been out of my mind with grief if I lost him to an ectopic pregnancy or anything else. As I mentioned in my grandmother’s story, ectopic pregnancy can kill you. Over at What to Expect, one member had a similar experience to my grandmother, in which she almost didn’t make it to the hospital. This story is important because Kristen describes symptoms that could easily be mistaken for something else. The Good Mother Project shares some incredibly upsetting and powerful stories from anonymous contributors. She does it to help others heal, which I totally respect and admire. One story is about how a woman lost her fallopian tube during an ectopic pregnancy and how it made her feel. Losing a part of your body, especially part of your reproductive system, can have a devastating emotional impact. Mary at New Orleans Moms Blog had quite a rollercoaster of emotions in her ectopic pregnancy story. Her first pregnancy was as textbook as it gets. Then came the infertility. When she finally did get pregnant again, it ended in ectopic pregnancy. To make it harder, it happened during the holidays. I hope these stories help you find solace in a difficult time. Ectopic pregnancy sounds so clinical and it can be difficult for those on the outside to understand just how deeply it can impact your emotions. Do you have an ectopic pregnancy story to share? Leave us a link in the comments and we’ll add it to the stories section. Sharing stories can help both you and others heal. The injection was offered to me as a secondary option. It was clear my dr. Wanted surgery. Two weeks before I found out it was ectopic my dr told me I was having a miscarriage. We directly had an ultrasound which showed us it was not ectopic. And it was normal and resolving itself. Grieving the loss was easy when counting our lucky stars we weren’t at an increased risk of a repeat miscarriage. Two weeks later I find myself on the bathroom floor sweating and thinking I may just die. I call my husband in the coal mine and they have him come up and get home. He took me to er and it took 4 hours for another ultrasound that showed the baby was in my Fallopian tube. I was admitted. Saw my dr next morning who did surgery and also a dnc. She said she was doing to test my right tube to see if fluid got through but didn’t want to damage it. She said patients can have a baby after this but my risk of ectopic is 20% higher. Since it was not easy to diagnose I’m terrified to try again. After all it took me 10 years to get pregnant again. Losing faith and feel like I’ve grieved and lost two babies. I am currently going through an ectopic pregnancy. I say “going through” because it’s a very long process. It was diagnosed 3 weeks ago, yet the emotional and physical pain is still there. The bleeding is terrible and the constant blood draws take a toll. I had methotrexate and that has terrible side effects of its own. This is a every lonely process for me because very few understand my grief. Having to go through surgery to be able to survive an ectopic pregnancy was the worst experience of my life. From the nurses asking if I was really in so much pain, why was I so calm? To the anesthesiologist asking me why I had been crying, and then him complaining how he was in the middle of dinner with his wife When he got called in to prep for the surgery. I returned to work after 4 days and 9 months later, still no baby and still hiding depression from my husband. I had just resently had a ectopic pregnancy . woke up in the morning about 5:30 with a pain on my side that I could not bare.so my husband had to rush me to the hospital at the emergency room.then the doctor could not say what wrong wit me and the when sum test result came back told husband that am pregnant. We did not know. Any way they took a ultrasound and saw the baby in my falluina tube and plus I had a cyst on it .that was a surgery must take the doctor say so I had my tube move ,my baby move and two cyst . am sad most of the time I see mother’s with babies.and wish that’s me. But I thank god am alive cause I could have die and am here.but am going to try again.I was3months . I am having an ectopic pregnancy at the moment. I just got my injections the other day…probably one of the saddest days of my life. My husband and I have been trying for only a short while and I found out I was pregnant. I wrapped up a pair of newborn shoes and had him open them…his reaction was what made it even more special. We cried tears of joy together. This was the first time I’ve ever been pregnant. At first they thought I was having a “normal” miscarriage but it turns out it had implanted in my fallopian tube. The hardest part is knowing o ur baby was trying to grow but had no hope of survival. Feel guilty for taking action to stop the growth. It would cost me my life it I didn’t. This is still all so fresh,.. I had an ectopic pregnancy last year. It caused my fallopian tube to rupture, and I needed life saving surgery to remove it, as well as a blood transfusion. It was a terrifying ordeal and I have suffered a great deal of stress and anxiety as a consequence. It is a difficult and taboo subject to talk about, so am glad that the feelings of grief and loss are being discussed and acknowledged here. I’ve never had an ectopic pregnancy and pray that I never will. All of you that have gone through this, I’m so sorry! Oh my goodness! How awful to have to go through. I am sorry for all of you that had that happen. Wishing your brightness and love! God Bless! I will never forget finding my friend in the bathroom in HS bleeding heavily and in pain. She was white as a ghost. Come to find out she did not even know she was pregnant and was having a miscarriage of an ectopic pregnancy. It was bad and a few days in hospital. I thought about it with pregnancy praying for a safe pregnancy myself even years later. It is not talked about but such a dangerous situation! I never had an ectopic pregnancy but have had a miscarriage about 10 years ago. To this day I still think about what if the miscarriage never happened. Thanks for sharing these resources…. I have never had an ectopic pregnancy but I know friends who have had one. It looks like you have a great list of resources to help those who have had one. I will definitely share with my friends. My 1st pregnancy was ectopic. My husband and I went through a saga of a pregnancy! I found out I was pregnant my doctor thought I found out super early because he couldn’t find anything though I had HGC levels. I started to progress and I began spotting. I was told that was normal and not to worry. At work I started cramping and bleeding really bad and my dr. Told me I was miscarrying. After what we thought was a miscarriage I was checked to make sure my levels went down. Problem was I was in fact still pregnant. They found the ectopic pregnancy and gave me methotrexate, it’s a chemo drug. All my levels went down but I ended up still pregnant and after thinking the nightmare was over my Fallopian tube ruptured while cooking dinner. I will never forget the pain and being scared shitless when my OBGYN rushed me to the hospital for emergency surgery because I was bleeding internally. I almost died and would have had my Dr. Not reacted quickly. I lost a child emotionally 3 times in one pregnancy and almost lost my life. I still have 2 ovaries and 1 tube. We’ve been trying but it’s not easy. I had a chemical pregnancy but nothing has stuck. Hopefully soon I will have a pregnancy that brings me my own bundle of Joy.